To learn more about our Environmental Policy, click here. Johnson Tiles Limited manufacture and supply ceramic tiles to either customer, company or standard specifications. 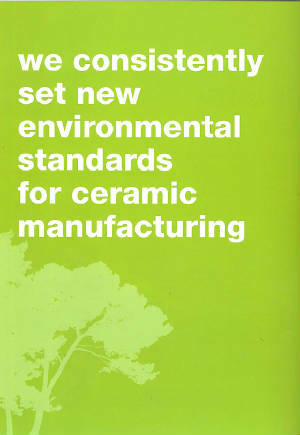 This Environmental Policy applies to all Johnson Tiles Limited's operations within the UK. Johnson Tiles Limited is an operational company of Norcros (Holdings) Limited. This policy complies with the Norcros (Holdings) Limited Group Environmental Policy and all other company policies. The Board of Directors of Johnson Tiles Limited considers environmental management an integral and fundamental part of the Company's corporate business strategy. A board member has been appointed to represent environmental issues. We will take all necessary steps to comply with U.K. and European legislation and other standards affecting our activities, together with any future standards of protection. Using the principle of continual improvement, the Company is committed to the prevention of pollution and aims to achieve the highest possible environmental standards. The efficient use of all materials, supplies, energy and transport. Wherever possible the principles of sustainable development will be adopted. Preventing, reducing or controlling, where practicable, emissions to all environmental media. The minimisation of waste from all parts of the company's operations. Wherever possible waste materials will be reprocessed or recycled. In addition, we will require high environmental standards from suppliers, vendors and contractors involved with the company. We will seek to develop and maintain, where significant hazards exist, emergency plans in conjunction the emergency services, relevant authorities and the local community. We will ensure that all necessary resources are provided in the areas of operational control, engineering, technology and training as are necessary to enable those with specific duties to effectively discharge their responsibilities. We will ensure awareness and participation of all our employees through communication, training and participation in continuous improvement teams. We will seek to develop the active co-operation and input of all stakeholders within the environmental management system in respect of concerns about the hazards and impacts of our operations. We will ensure that this policy is publicly available to suppliers, customers, stakeholders and the genral public through distribution of copies, public registers and the use of information technology. This policy, its underlying procedures and the effectiveness of its implementation will be monitored and reviewed by the Environmental Management Steering Committee and the Board of Directors. This policy document and the objectices and targets will be updated, as necessary, following annual management reviews. If you have a question, comment or problem, please e-mail us at: toffeeman1@aol.com, call us at 732-264-0202 or fax us at 732-264-0222.